“Throughout my amateur career, the higher the level I went to, the better I got,” says Ryan Burnett. 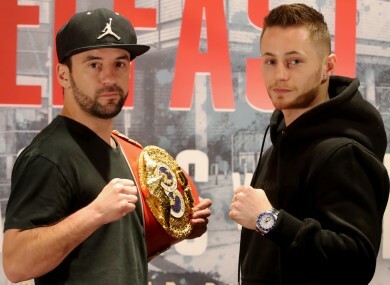 Bristol’s IBF world bantamweight champion Lee Haskins (left) and Ryan Burnett are set to compete. RYAN BURNETT INSISTS that his step up to world-championship level tonight will inspire a performance to match the great expectations that surrounded him as an amateur. ‘Belfast Boy’ Burnett headlines a fight bill for the first time in his hometown as he takes on Bristol’s IBF world bantamweight champion Lee Haskins at the SSE Odyssey Arena, live on Sky Sports. A graduate of Gerry Storey’s famed Holy Family club in Belfast’s New Lodge, Burnett’s 2010 Olympic Youth gold and World Youth silver successes saw him marked out as a future senior star before he opted to turn professional under Ricky Hatton less than three years later. A series of setbacks — including a failed brain scan, which was subsequently cleared — derailed his early progress in the paid ranks before the Belfast native eventually gained momentum under the tutelage of trainer Adam Booth, who previously guided the likes of Andy Lee and David Haye to world titles. While the 25-year-old carries an undefeated 16-0 record, claiming British and stepping-stone titles along the way, Burnett has acknowledged that he has not yet fully delivered on the promise he showed as an amateur. But the home favourite insists he will rise to the occasion tonight in front of an anticipated partisan crowd of around 4,000 Belfast fight fans tonight. I’ve always said it takes a great fighter to bring out the best in me,” said Burnett ahead of his clash with 37-fight veteran Haskins, who has lost just once in nearly 10 years. “Throughout my amateur career, the higher the level I went to, the better I got and I think it’s going to be the same in the pro game,” continued the 25-year-old challenger. Matchroom’s Eddie Hearn has labelled Burnett the ‘new Carl Frampton’ in the build-up to tonight’s bout, with the promoter suggesting that a title win will lead to more big fights nights on home soil for the 25-year-old, including a possible co-headline slot on a bumper bill alongside Katie Taylor later in the year. The challenger will need to win convincingly if he is take the first steps towards justifying those grand comparisons with his fellow Belfast fighter and two-weight world champion Frampton, however. While Burnett’s last five bouts have gone the distance, there is a suspicion that Booth has yet to let his protégé off the leash and the trainer has hinted that the fighter’s mean streak will be on show this evening. Ryan’s got a lot of fire in his belly,” said Booth. “I’ve seen that he has this extra gear. That extra gear is called ‘crazy’ and he has it, with absolutely no thought or care about what may or may not happen to him or what the end result will be. “He will just let go and I know it’s there. If you do it right, you don’t have to tap into it… But he is ferocious… he’s ready to do whatever he has to do,” added the trainer. Burnett also echoed those sentiments when asked if he has another gear to hit as a pro. “I know myself that I can be nastier than everyone’s seen, but Adam’s taught me how to hold that back and be patient with it and unleash it at the right time,” said Burnett. Bristol native Haskins carries a 34-3 record, with the 33-year-old heading into his second full world-title defence. A tricky southpaw, his style is commonly described as awkward, and not in a complimentary sense – if the term can ever be applied to a fighter in that way. However, those qualities are expected to present a test for Burnett, who is priced as a heavy money-on favourite with the bookies despite the fact that this is his first world-title bout. “Yeah, ‘awkward, rubbish, I’m not entertaining’… I’ve heard them all,” laughed Haskins on his reputation before agreeing with the suggestion that his sometimes-unattractive style often distracts his opponents from concentrating on their own strengths. As messy as Haskins may be able to make it, it will be a surprise if Burnett does not deliver a tidy winning performance. In the main support bouts, Belfast pair James Tennyson and Paul Hyland Jr both have shots at stepping-stone titles, while Cork-based Cuban Mike Perez is due to fight at cruiserweight for the first time against undefeated Slovakian Viktor Biscak — a late replacement opponent after a planned bout against former Irish amateur champion Tommy McCarthy was scuppered. TV: Live on Sky Sports 2 from 8pm. Email “The ‘new Carl Frampton’ ready to step up to world-championship level ”. Feedback on “The ‘new Carl Frampton’ ready to step up to world-championship level ”.